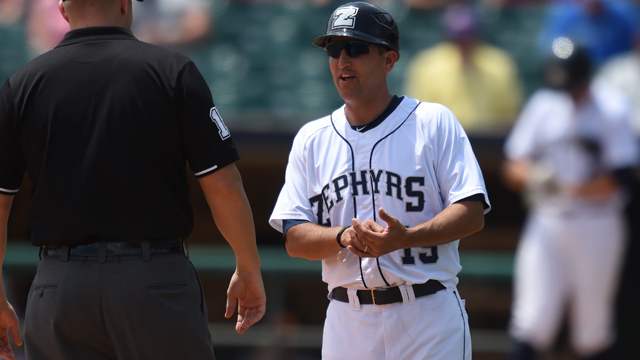 Andy Haines will return as manager of the New Orleans Zephyrs for the 2015 season, and will be joined on the bench by pitching coach John Duffy, hitting coach Damon Minor, bullpen coach Ronnie Deck, athletic trainer Chris Olson and strength and conditioning coach Quentin Eberhardt. Entering his eighth season in the Miami Marlins organization, and seventh as manager, Haines guided the Zephyrs to a 70-74 record in his first season at the Triple-A level in 2014. He then went on to manage in the Arizona Fall League, where his team captured the league championship. Haines previously managed the Class A Jupiter Hammerheads of the Florida State League for two years, coming within one victory of the league title in 2012, and his Greensboro Grasshoppers club claimed the 2011 South Atlantic League crown. Haines started in the Marlins system as hitting coach of the Gulf Coast League affiliate in 2008, before taking the reigns of Jamestown of the New York-Penn League the following year. Including his managerial debut with the Windy City Thunderbolts of the independent Frontier League in 2007, where he skippered his team to a title and a league record for victories, Haines has compiled a 459-409 record in seven seasons as a manager. Duffy comes to New Orleans following a five-year stint as pitching coach at Double-A Jacksonville, which included Southern League championships in 2010 and 2014. Duffy is entering his 11th season in the Marlins organization and 24th year overall in the coaching ranks. A member of three Sun Belt Conference championship teams at the University of South Alabama from 1980-83, Duffy played six seasons in the minor leagues before going into coaching in 1990. Minor returns to New Orleans for a fifth season as hitting instructor. After making his professional coaching debut in 2011, Minor presided over a Zephyrs offense that set a franchise record by hitting 153 home runs in 2012. Minor played in 136 games over parts of four seasons with the San Francisco Giants, and established career highs in 2002 by playing in 83 games and hitting 10 home runs, helping the Giants to the National League pennant. Following his retirement in 2006, Minor returned to his alma mater at the University of Oklahoma as a hitting instructor. Deck joins the Zephyrs staff as bullpen coach, his first season with the Marlins. Deck played professionally for seven seasons, including two in the Tampa Bay Rays system from 2002-03, before beginning his coaching career in 2005. He served as hitting coach and catching instructor for Haines with Windy City in 2007, then spent six years as bullpen catcher for the Baltimore Orioles. Olson is entering his fourth season in the Marlins organization, and third with the Zephyrs. He debuted with Greensboro in 2012, where he handled the trainer's duties for the Northern Division All-Stars in the South Atlantic League All-Star Game. Eberhardt rejoins the Zephyrs for his sixth season in professional baseball and second in the Marlins system after spending most of 2014 as the team's strength and conditioning coach. The New Orleans Zephyrs open the 2015 season on Thursday, April 9 at 7:00 p.m. against the Omaha Storm Chasers. 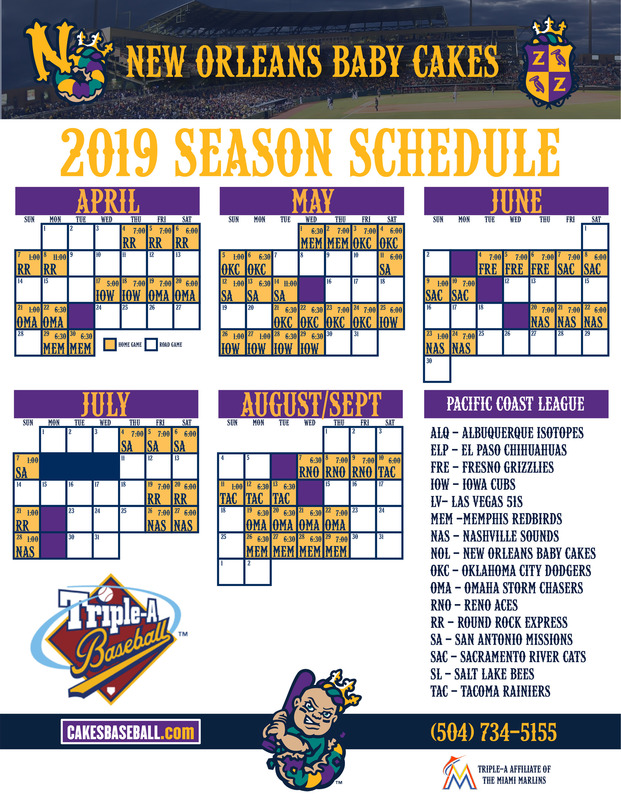 Ticket packages are on sale now by calling the Zephyrs at (504) 734-5155.